This is where the detective work needs to be done carefully. The nerves to the upper and lower teeth and jaw have a common nerve trunk going to the brain. It is called the trigeminal nerve. It is also known as the fifth cranial nerve. It has three main trunks. One trunk goes to each jaw and the third trunk ends around the eye. Pain in teeth if it becomes severe enough, can “travel”. The pain perception extends beyond the site of the culprit tooth to along the nerve on which supplies it. Generally if a lower tooth nerve is inflamed greatly the pain is felt to travel to the ear. In the upper teeth the pain can go up the side of the face. However if the intensifies then the pain is felt in the opposite jaw. In extreme situations the pain travels along the third trunk to be experienced around the eye. It is rare that the pain to cross to the opposite side of the face. Sometimes the pain can be perceived to go to a tooth that has had pain in the past. Don’t worry it gets worse. As the upper teeth roots are close to the sinuses, an inflamed sinus can refer pain to the upper back teeth. Occasional very inflamed ulcers can be often mistaken as tooth ache. Rarer conditions such cysts, tumours, and nerve diseases can also give rise to pain. Even a cracked filling or decay on one side of the mouth may cause discomfort on the opposite side. 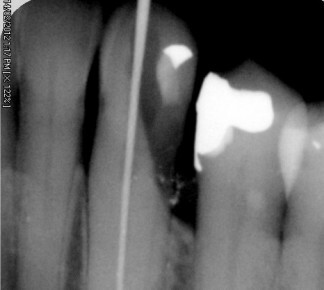 This occurs by simply overloading one side by the avoidance of the tooth on the other side. With any jaw joint pain we always make sure there is no decay in the mouth. A hole in a tooth may cause to the bite to be thrown out. What can be done to find the site of the real pain? Look to the notes and see if any teeth have a history of problems. 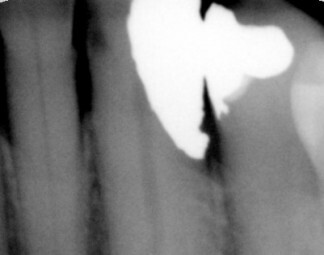 Take x-rays to find decay or other problems such as gum disease, cysts or broken structures. Tap teeth to try and reproduce the pain. Cold and hot tests to see if a normal response occurs. A nil response may mean the nerve has died, but a heightened response means the nerve is inflamed. If a tooth is found to be the likely problem then numbing the tooth may confirm it. The referred pain will go when the anaesthetic starts to work. Check the bite to see if there is excessive loading on any tooth. Look for any swellings or problems on the gums and elsewhere in the mouth. Is there a history of an inflamed sinus? The list continues if the pain does not have a typical pattern. A rule of thumb is treat the obvious problems then wait and see. If there is nothing obvious then waiting will tend to localize the pain. “First do no harm” needs to be followed. In severe situations a referral to a specialist may be needed. Deep filling on nerve of lower canine caused pain The lower canine starting a root canal	 Nerve treatment on canine, but pain moved to last tooth same side. Leaking filling (left) replaced with new filling (right).Pain stopped.